Sorry I have been so late on getting the reports out. I have been putting my entire behind the computer time working on the tour DVD. It�s looking good and still should be out by Dec. its going to be long, close to two hours long. I was able to get out to the island this week. During the five min slack current; I was able to land three small spades. The current turned on hard as I attempted to anchor off on the on the spine. The current was ripping way too hard and I retreated to the side of the island. Baby black sea bass ruled that area and I headed on in with the outgoing current. Before the hurricane passed by, Damien and I paddled out to the island. During the slowing current Damien targeted spaded and caught one, while I targeted sheepies. We moved to another spot and she hooked into the black drum. Since the hurricane blew by the weather has begun to transform into the beginnings of fall. Soon it will be time to fully target the fall running species. As soon as I can get the tour DVD, I can get out and GET ON�EM! and I found some bites off of the pilings. I hooked one and it got off then I hooked a sheepie. The interesting thing was where it was. It was about 8 feet off of the pile. We have seen sheepies swimming with schools of spadefish when the water was real clear. This one wasn�t on the pile but out with the school of spades. When the current got going, I dropped fiddlers to the bottom of the pile and began to get trigger bites when I landed one, Rob dropped down to get one and hooked into something that wasn�t a trigger, it was a 26� sheepie. Kayakfishingradio.com is a weekly online radio show with callers from all over the kayak fishing world. Check it out and call in. It felt good to paddle a light boat this week and get out to the CBBT for the summer species. Sheepshead was the target and Lee caught the first one with a release citation over the 24 inch mark at 25�. I caught a summer surprise 18� tog. The algae bloom swept into the area so we paddled out past it to some clearer water. As the current slackened I dropped a clam to test the waters for spadefish, I was hesitant wanting to get a citation sheep. I had a nibble and we changed gears and targeted spades. My first solid hookup was a 19 inch sheepie, always a nice surprise when spade fishing. On the next solid hook up I knew immediately it was a sheepie and a big one. It was a sketchy fight on my relatively light spadefish rod. I pushed away from the piling and turned him out from a certain break off. Lee asked, �are you sure that�s a sheepshead?� I said, �oh yea!� as it broke the surface �Positive!� measured out to 26�. I had my hand scales on board but forgot to get a weight on both of our sheepies before releasing them. As the current began to flow we picked up a few spades. The next day we could get out Lee, Damien, Tex and I hit the bridge again for sheeps and spades. No action on the sheepies but Damien landed a nice trigger and a few spades. I found a few, all in the 12� range except tex who hooked into a 20�er which got off on the leader grab. But it was good to see that size out there. Our sheepshead fishery is making a comeback after being fished hard during the years before our four fish limit. Please catch and release the big breeders which can be as old as 30 years, so this potentially outstanding kayak fishery will comeback strong. The fight is well worth the time targeting them for the fight alone. If you can find one the fight will surprise you so be ready when you GET ON�EM!... then release that awesome fish to fight again. 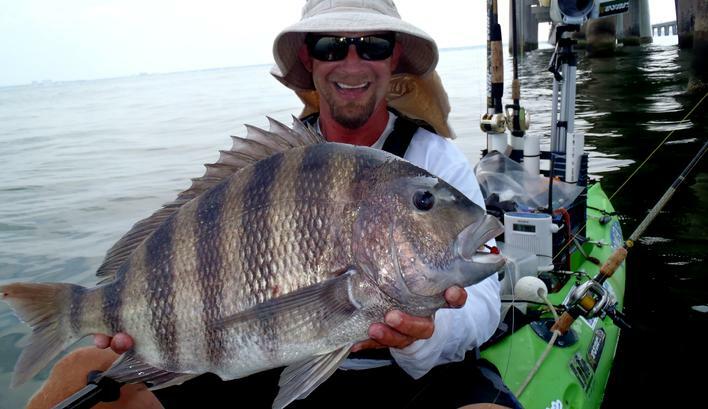 I heard the black drum were already at the CBBT islands so that was my main target this week. These drum area notoriously finicky and skittish around the islands this time of year, it�s not like casting to a school of reds that are aggressive; you can make a perfect cast to a school of black drum and watch them turn away. I have a hard time standing on my prowler 15, I can�t get my feet wide enough to feel stable, and so my sight casting at the island is limited. I was able to stand and paddle on the flat side of the island and found one by itself scrounging around the rocks. I was able to turn without spooking him and made a cast with a 1oz spro bucktail and a strip of clam right next to his head. I pulled it off of the rock and it fell a few feet with the drum following it. I twitched it away and retrieved it for another cast. The drum was still looking or smelling for it. My cast dropped it beside it head again, I saw him move toward it and felt a tiny tap on the line. I felt the tension and set the hook. I sat down as I began to get pulled away. The drum hit the surface and I had �em hooked in the pectoral fin. I guess when he turned toward the jig the tap I felt was his fin. I think if I waited a few more seconds he would have found the clam strip and ate it. Since he did not bite, I did not register a citation. It was a good fight and great footage regardless of the foul hooking. I help out Capt. 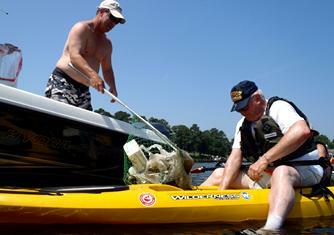 Reese and crew with the annual Clean the Bay day this weekend. 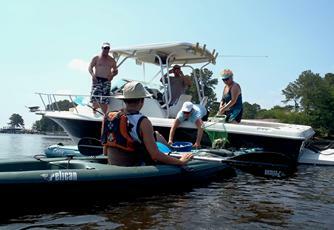 Our clean up territory was the long creek area of the Lynnhaven waterway. Reese and his wife Nancy were in the boat collecting the trash the Glen Caldwell, two of Reese�s students and I retrieved with our kayaks. I have been paddling my tour kayak in preparation for the bay crossing and the beginning of the tour. Next week I launch for a six week 600 mile paddle around the Chesapeake Bay.